Well-structured activity blocks for Aarti, Religious discourses etc. Barkot is a town and a nagar palika in Uttarkashi District in the state of Uttarakhand, India. It is located on the banks of the Yamuna river. Harshil is a village and a cantonment area on the banks of the Bhagirathi River, on the way to the Hindu pilgrimage, Gangotri, in Uttarkashi district of the Indian state of Uttarakhand. Situated at a height of 7,860 ft from sea level, Harshil lies 73 km. from Uttarkashi, and 30 km away from Harshil lies the Gangotri National Park, spread over 1,553 square km. Any en-route or personal expenses such as alcoholic and nonalcoholic beverages, telephone calls, tips & gratuities, laundry etc. Personal equipment like clothes, shoes, day packs, personal medical kit etc. •	Arrival at our hotel in Haridwar Ganga Lahari. •	After Lunch rest of the day for your leisure. •	Overnight stay at the Hotel. Biometric Registration is compulsory for this yatra which will be done by guest and it will be at Haridwar/Rishikesh. •	after breakfast drive to Barkot . Barkot is a place of great scenic beauty with spectacular views of snow-capped mountains all around. A magnificent view of the eternal snow peaks of Bandar punch can be seen from here. •	Arrive at Barkot with traditional welcome & check in at The Chardham Camps Barkot by Leisure Hotels. •	Details discussion on ‘Maa’ Yamunotri by our Yamunotri destination experts following by Hi- Tea. •	Dinner following by Katha Saar and overnight at The Chardham Camp, Barkot. •	After early breakfast depart(till 6 O’clock) to Yamunotri, we will proceed to Hanumanchatti via Syanachatti (5 Kms. Before Hanumanchatti), from here local taxis are available for Jankichatti. From Jankichatti we begin our trek to Yamunotri (6 km/3 hrs) to visit the temple of Goddess Yamuna, situated on the bank of the river. •	You can take a holy dip in the nearby tank filled by hot springs and cook rice in its water, the common rituals performed by the devotees. •	We return to Barkot in the evening. •	Overnight at The Chardham Camp, Barkot. •	After breakfast, we will proceed to Harsil(till 6 O’clock) one the most beautiful valleys in the world. Travel Route Barkot to Dharashu Bend/Uttarkashi/Uttarkashi Vishwanath temple, En-route we will stop at Gangnani for hot water spring dip. •	Arrive at Harsil with traditional welcome & check in at The Chardham Camps Harsil, after Hi-Tea we will move to Mukhwa Village by walk (If we have time) - Mukhwas Village is one of the popular tourist attractions of Harsil located just 1 km from it. It is the winter home of Goddess Gangotri as Gangotri itself is prone to heavy snowfall making the place pure and beautiful. People visit here in large numbers to worship the Goddess and admire the beauty of the place. Details discussion on Maa Gangotri by our Gangotri destination experts following by Hi-Tea. •	Overnight at The Chardham Camp Harsil by Leisure Hotels. Today Sightseeing: Gangotri Temple, Surya Kund, BhagirathShila, Kalpeshwar Mahadev, Mukuba Village, Winter seat Gangotri. •	After breakfast, we proceed to Gangotri (till 8 O’clock). On arrival take a holy deep in the River sacred The Ganges, also called Bhagirathi at its origin. •	Perform pooja and relax in the lovely surrounding. •	In the afternoon return back to Harsil Overnight at Harsil. •	Overnight at The Chardham Camp, Guptkashi by Leisure Hotels. Lunch is not include on this day but guest who reach in the camps timely till 2 O’clock after noon than we will provide the lunch as complimentary. •	After breakfast, we proceed to Helipad (as per given time by Aviation for Helicopter). We proceed to take the helicopter till Kedarnath we take you to visit Kedarnath Temple for Darshan, Aarti & pooja. •	After the holy darshan way back to Guptakashi Camps Via Helicopter/Drive. 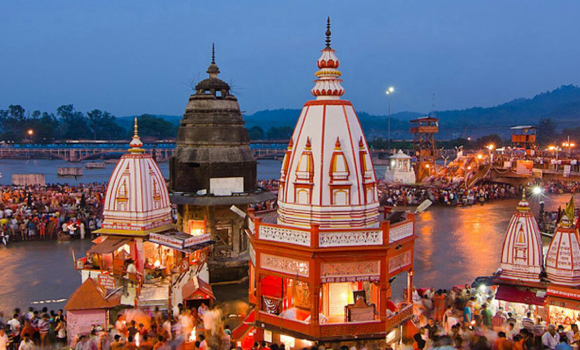 •	Dinner and overnight stay at The Chardham Camps, Guptkashi by Leisure Hotels. •	After breakfast, we proceed to Joshimath (till 7 O’clock), Travel Route Temple at Ukhimath / Wild life sanctuary at Chopta /Chamoli/Pipalkothi/Helang valley, one of the most beautiful sites on the whole trip. •	Enjoy the beautiful drive through medicinal forest. •	Tea break at Chopta- is also known as “Mini Switzerland“, and is getting popular year after year. Chopta Hill Station is located at an altitude of 2700 mts, Chopta is surrounded by dense forest, and offers majestic view of Snow Clad Himalayan Ranges and lush green meadows. It is also the starting point of the trek to famous Tungnath Mandir (Panch Kedar Temple) and Chandrashila Summit . The Chopta region is rich in varied flora and fauna, with plenty of Rhododendron and Deodar trees all around. 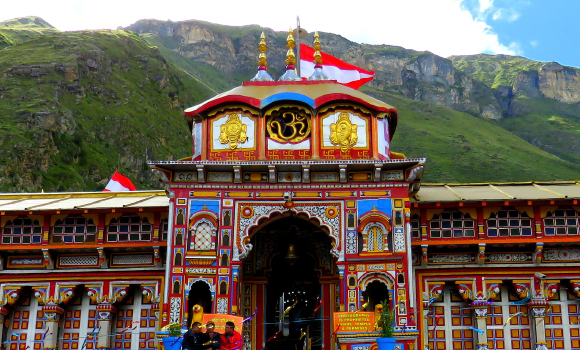 •	Arrive at Joshimath with traditional welcome & check in at The Chardham Camps Joshimath followed by Lunch, Details discussion on BadriNath Ji by our BadriNath destination experts following. •	After breakfast, we proceed to Badrinath (till 6 O’clock). •	On arrival take holy Darshan and spend time visiting Mana Village. •	We return to Joshimath in the evening. •	Overnight at The Chardham Camp, Joshimath. •	Morning after breakfast, we proceed to Rishikesh (till 6 O’clock). •	Visit to Devprayag- Alaknanda River is on the right and Bhagirathi River is on the left. (Prayag means confluence, hence the prayag in the name Devprayag). •	The two join together to flow forward as the Ganga. •	Lunch (Packed) will be enroute. •	Evening arrive at Rishikesh. •	Morning after luxury breakfast, check out to the hotel (till 11 O’clock). •	We hope you take back happy memories of our Chardham Fixed Departure Tour. Due to matters outside our control, such as adverse currency fluctuations, fuel surcharges, taxes and airfare increases, Prices are subject to change without notice. Click on the “Book” and select the desired travel date. Ensure that your passports are valid for at least six months from the date of travel. Ensure that the Names provided should match the travel document. Booking for 2Adult +1 Child, please book as Double Sharing basis where, The Child will be sharing parents bed or the child will be provided no bed. Booking for 3Adult +1 Child, please book as Triple Sharing basis where, The Child will be sharing parents bed or the child will be provided no bed. Booking for 2Adults and 2 Children, one of the child should be booked as an Adult in a Triple Room. Once Booked, you will receive a mail with Booking confirmation no. Allow us 24-48hrs time limit to revert with the Service Confirmation Voucher to your registered email ID. Booking form to be duly singed when requested for. ​Alternately, you can call +971600524444 or email at holidaysoutbound@cozmotravel.com for any help in booking. Copyright © 2018 Cozmo Travel LLC, UAE. All Rights Reserved.